There were 7 participants in the workshop. All participated in the first steps: free-writing on a physical place, and then a guided meditation on what it’s like to be in that place, focusing on tempos present in the movement of objects through the space, the tempo of the place itself, and the inhabitants (inanimate or animate) of that place. Next, I divided the 7 into two groups. Each group nominated a “customer” that the others in the group would make a performance for. The customer then shared their place with the performers, either by reading from the free-written text, or describing the place in another way. The performers were each given spheres of responsibility: one for text, another for movement. They were asked to consider the tempos discovered in their own meditations, and to respond spontaneously to each other when creating the improvised performance. The customer was asked to choose a method of documentation: one chose to video the performance, the other sketched it. Both customers chose to record their performances themselves, although they were invited to nominate a recorder if they wished. Finally, one of the performers chose a location to stage the performance, and briefly shared what appealed to them about that location. Then the performance began. Both performers and ‘customer’ participated in the free-write and meditative content-generating steps. 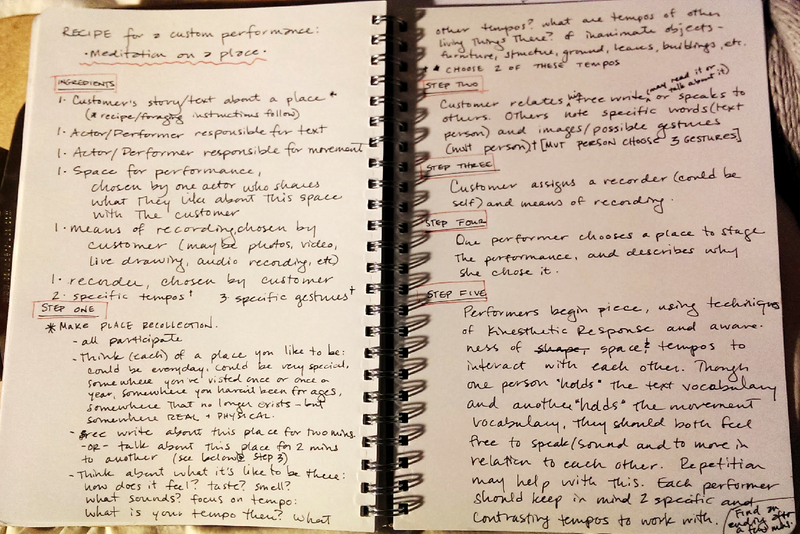 This helped the performers and the ‘customer’ feel more connected to each others’ stories and ‘responsible’ for them. This feature may be difficult to replicate in a more public version of the Lemonade Stand, but was a satisfying part of this exercise. The performers were trained in similar and complimentary styles of physical theatre that helped them work easily together and be aware of interacting with each other and the content during the improvisation. The recipes in my Cookbook lend themselves to use by performers who are familiar with each other and with working in compositional structures for ensemble-based theatre. The ‘customers’ each chose a method of recording the performance that they kept for themselves. I believe this takeaway adds to the structure of the ‘customer’ role to help the performance feel like a gift. Each performer was ‘responsible’ for a certain aspect of the performance: choosing the playing space, integrating text, or integrating movement. While any performer could (and did) work with any element of the piece, each was empowered to make more significant creative decisions within certain realms.